Sarah is an AmeriCorps worker from Texas and began her year-long assignment with us in September, 2014. As of this writing, March 2015, I am halfway through my AmericaCorps service year working with the Wareham Land Trust and the Buzzards Bay Coalition. I serve as a Community Engagement Coordinator, connecting people to their outdoor environment. With so many diverse conservation areas, the residents of Wareham have numerous opportunities and places to explore and I’ve enjoyed fostering those relationships. As an outsider experiencing this area for the first time, I must say it is beautiful! I’ve lived here now for six months, but had never even visited New England before last September. The views are incredible and the amount of natural land is astounding. I take great pride knowing my time here is spent helping to protect the diverse landscapes of the region. I was first attracted to coming to this area for the coastline. But the views from the forests and marshes that open into the ocean often left me speechless. It is a rare treasure to discover so much undeveloped coastline and the residents of the entire Buzzards Bay watershed are lucky to have such a pristine resource at their doorstep. 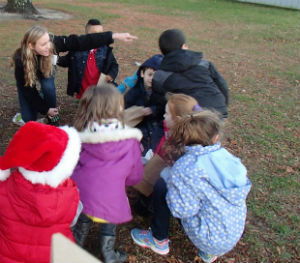 As part of my service year, I have led many different outdoor discovery programs, both for the general public and local schools. These have ranged from nature hikes for adults to beach exploration for toddlers and forest exploration with elementary students. All of the programs have concentrated on different ages and demographics, but they all strive to foster excitement and appreciation for the outdoors. Through these programs I have encountered many different types of people. I have met some who have spent their entire lives exploring the outdoors and feel more at home in nature then in their actual home. I have encountered children who have never explored a forest before our program. I have met people who are afraid of the outdoors, and people who are dauntless when it comes to exploring. These people all have a different relationship with the natural world, but after spending time exploring it, they all understand its value and why it is worth protecting. At its core, conservation is an emotional experience as well as a rational one. With about half of my service year still ahead of me, I know that I have a lot left to experience. There are many more outdoor exploration programs to facilitate and projects that I still hope to see unfold. There are still plenty of conservation properties I have yet to discover and members of the community I have yet to meet. While I can look back at the past six months and smile, I am looking forward to the next six months even more. And yes, part of that is because it will be much warmer!